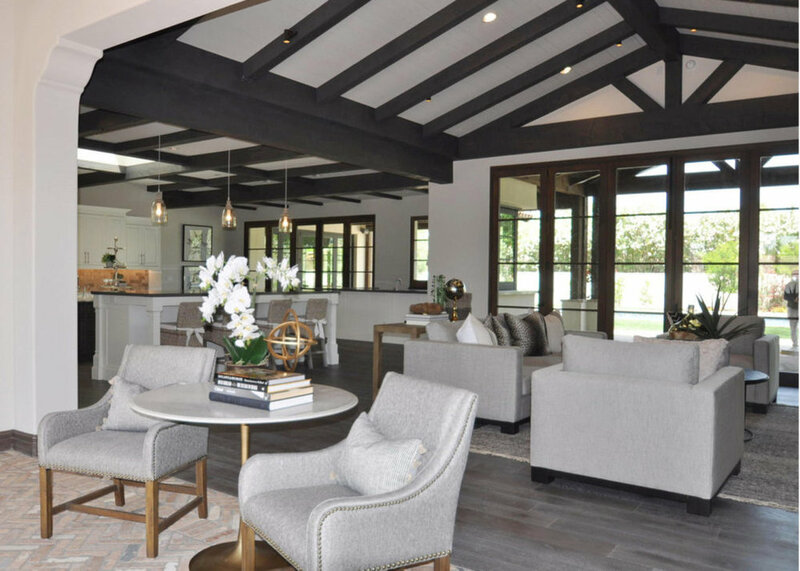 This Paradise Valley custom home is the most recent project completed by bungalow stylist’s Jeff Furtado and Len Annesi. A multi million dollar residence finished in a Santa Barbara style, nestled between Camelback and Mummy mountains, this newly constructed home is ready for its first owner.The soft modern styles of the furniture and art highlight the stunning beams and custom woodworking through out the residence. Soft gray tones in the fabric, blended with an exotic black and white ottoman in the spacious living area offer an eclectic element that would work in any room in the home. All the furniture, from the brilliant white marble top with gold matte finish base entry table, to a raw wood console placed opposite the kitchen island, give the new owner all options to make this the elegant casual residence exactly what you would expect to see in this premier neighborhood.